The Dowd Agencies are proud supporters of Big Brothers Big Sisters of Hampden County. In collaboration with Hartsprings Foundation we will be taking part in a clothing drive for the entire month of August. Hartsprings was founded in 1997 with the purpose of funding Big Brothers Big Sisters mentoring programs in Massachusetts and Connecticut. With a partnership with Savers Thrift stores Hartsprings turns your unwanted items into funding for five Big Brothers Big Sisters agencies. 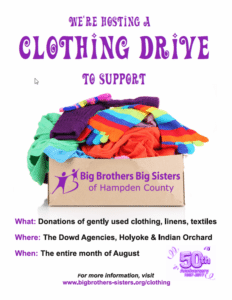 Please donate any gently used clothing, linens or textiles at our Holyoke office located at 14 Bobala Road or our Indian Orchard office located at 485 Main Street. You can read more about the Summer clothing drive here.